As a young boy, Shelby Smoak is diagnosed as a hemophiliac, and to complicate his situation, he has been giving a life-saving transfusion of blood that later is found to be HIV positive. Bleeder, begins five days after Smoak’s eighteenth birthday, with his understanding, for the first time, that he is HIV positive. Telling the tale of illness, and of circumstances beyond one’s control can be fraught with self-pity, but Smoak, in lucid, straightforward and authentic prose does not indulge these inclinations. Instead, the multi-layered memoir is laced with the yearnings and desires of a young man, grappling not only with the struggles any young adult would, but also with health concerns well beyond any usual struggles. I remove the trash bag from the can and ponder the AZT bottle one last time before hauling it to the dumpster. Outside, a cool breeze blows the stink of trash towards me, and I feel nauseous as I hurl the bag over the container’s top. The bag flies up and hovers momentarily before descending and crashing against the metal inside. When I hear the heavy thud of it settling, the crackling of glass, the woofing exhale of foul air—I cross my fingers and wish for the strength and health immeasurable. My supervisor prattles on, enumerating my poor achievements. Her hands tremble. Her voice quavers. Principal Trask also averts his eyes and only watches the supervisor reading. I give a hard stare to his crooked nose—it now appearing even more crooked—and I lower my gaze and admire the lace of my shows, the droop of my tie, the crack in the floor, the drip of my tears on my khakis. After trumping up reasons to reprimand him, the supervisor and principal give Smoak one week to improve, or he will be replaced. When Smoak, aware of his situation and severe prejudice against him, which will be corroborated by the one colleague at the school who accepted him, gives his principal his resignation letter, the principal shows absolutely no remorse. Episodes such as this one, told with glaring honesty, stand as testament to the way average Americans can act thoughtlessly and with outright cruelty to those who live and manage illness. 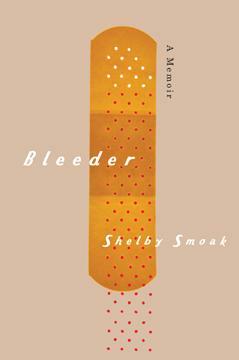 Yet, for all the obstacles thrown at Smoak, Bleeder ultimately comes together as a story of resilience and hope. The setbacks rendered in the memoir are always temporary, and the spirit of its author, without dipping into melodrama or sentimentality, is one of searching for what’s ahead, for a hard-earned optimism that refuses to be checkmated by the plays made by his complicated health. Smoak also catalogues his various interactions with health professionals, eye-opening to any reader who is not living with a chronic disease. Bleeder is a brave book, not because it seeks out bravery, but because it dares to show a life as it is, and not cave to easy affirmations or attention-seeking pity. It becomes a tale of endurance, of strength, and how to live against the odds. Renée K. Nicholson lives in Morgantown, WV, splitting her artistic pursuits between writing and dance. Renée earned teaching certification from American Ballet Theatre and an MFA in Creative Writing at West Virginia University. Her writing has appeared or is forthcoming in Chelsea, Mid-American Review, Perigee: A Journal of the Arts, Paste, Moon City Review, Cleaver Magazine, Poets & Writers, Dossier, Linden Avenue, Blue Lyra Review, Switchback, The Superstition Review, The Gettysburg Review and elsewhere. She serves as Assistant to the Director of the West Virginia Writers’ Workshop, and was the 2011 Emerging Writer-in-Residence at Penn State-Altoona. She is a member of the book review staff at Los Angeles Review, is co-host of the literary podcast SummerBooks and co-founder of Souvenir: A Journal. Her website is www.reneenicholson.com. This entry was posted in Book Reviews and tagged AIDS, Bleeder, book reviews, hemophilia, HIV, Michigan State University Press, MSU Press, Renee Nicholson, Shelby Smoak. Bookmark the permalink.